On the busy Haatso – Atomic junction stretch of road, 11 kilometers east of Ghana's capital, Accra, active commercial activities are rife, loud music can be heard from a mini music shop as well as a nearby street preacher's loudspeakers. Commercial vehicles also queue in a snail-paced traffic, tooting horns at the least provocation. It is a few minutes past 2pm, the weather is very hot, 30 degrees Celsius, and the conditions seem just right for Martha Ntumy, who has been selling sachet water on the street for a little over a year. 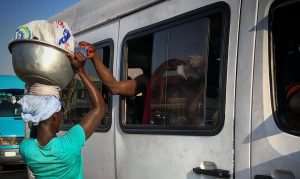 The 22-year-old, with a bowl of sachet and bottled water as well as energy drinks, chases after moving commercial vehicles to sell these products to passengers who offer to buy. For her, the job comes with many risks and challenges, key amongst them being enduring several hours, of moving up and down the street on foot to meet the needs of thirsty and drained passengers. “It is challenging for me. The sun scorches so hot sometimes that when you get home you are unable to sleep because you feel hot and sweat profusely. I went to the hospital once due to that, but I just can't stop this work because that is my source of livelihood… I make about GH¢23 [$4.6] a day and fortunately, I don't have any dependent. I only take care of my personal needs. “The weather sometimes does not help us. Our products easily get warm and when that happens, passengers don't like it,” she said. Martha is among the many Ghanaians who can attest to the warmer days experienced all across the country in the past few weeks. The month of March has always had the most number of hotter days in a year in Ghana, at least since 1991, but the experiences of 2019 seem to be worse. The inconvenience of enduring the recent blazing hot weathers might easily be confused as one of those regular hot days characteristic of the first quarter of each year.However, analysis of data collected over the past 28 years shows that Ghana is in hotter days and by extension hotter years. Weather records for the past days against those of the same period a decade ago show that the hotter days are now much warmer than the historical hot weather averages with the colder days also much hotter than the historical average for cold days. With the warmer temperatures, the attention of environmentalists is being directed to the imminent adverse effects of climate change on the country. Ghana's public health, agriculture, forestry and water resources are at risk of the adverse effects of climate change. Ghana was ranked 93 out of 182 countries in the 2019 Climate Risk Index, which puts the country at moderate risk of the impact of climate change. The report was based on the impacts of weather-related loss events such as storms, floods, droughts, and heat waves for the year 2017. In 2018, dozens of lives of Ghanaians were lost to floods in various parts of the country, especially in the Northern sector where many people live in deprivation and are vulnerable to all forms of disasters. Records of the more damaging impacts of climate change in the country have been felt more in the Northern sector where the vast land area is predominantly Savannah. 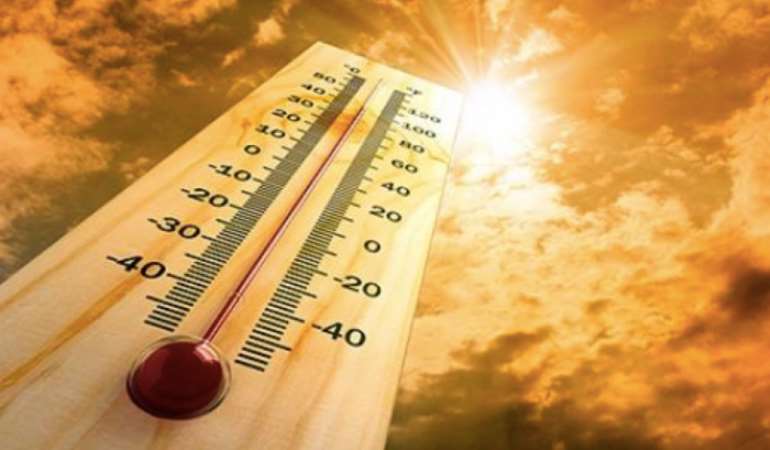 Average temperatures are rising faster in that area than in the South where the highest temperature recorded recently, according to data from the Ghana Meteorological Agency (GMet) has been 35 degrees Celsius. In the Northern sector, temperature in March went as high as 43 degrees Celsius reading from places such as Tamale and Navrongo. Temperatures were 40 degrees Celsius and 39 degrees Celsius in the same areas in 2017 and 2018 respectively. What this means is that the water needs of the people may not be met as their various sources of water; streams, wells and rivers will dry up faster. Another linked challenge is dried up farmlands, declining crop yields and corresponding food insecurity. In the Southern part of the country where there are fairly more urbanized towns and cities, the effects of the hot temperatures have equally been unpleasant. Exposure to the levels of heat experienced in recent times, can cause among other things, heat exhaustion, whose symptoms include profuse sweating, dehydration, dizziness and fatigue. Worse repercussions are experienced by children under age five, adults over age 70, obese persons and those whose jobs require them working outdoors for the most part of the day such as Martha who says for her GH¢ 23 ($4.6) average daily profit, she will rather bear the brunt of the hot temperatures to serve commuting Ghanaians than consider her personal health. The National Disaster Management Organizations (NADMO) in first week of March issued an alert on heat exhaustion over an expected national temperature of between 39 and 42 degrees Celsius which was the highest for the week and most of the days in the first quarter of the year. The organization among other things advised drinking of “plenty fluids (cool water and juices)” to stay hydrated and safe from the negative effects of losing bodily fluids to the hot weather. The health effects of the prevailing situation cannot be underestimated. 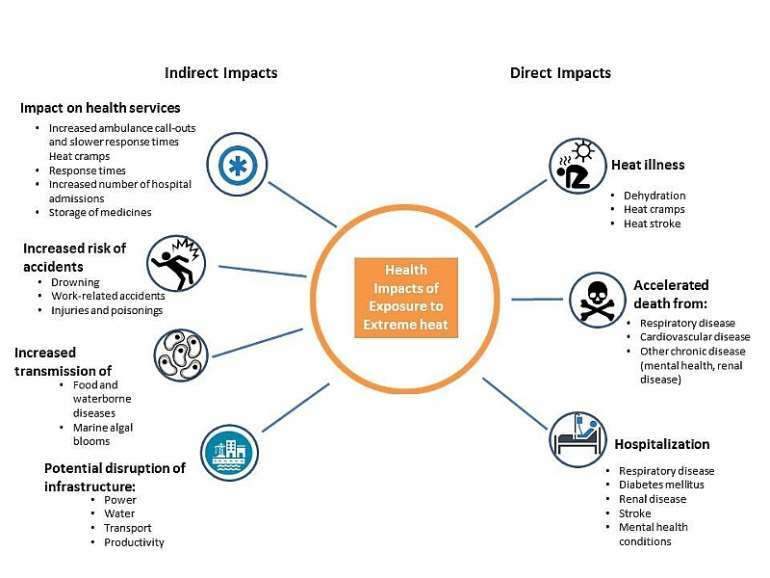 According to the World Health Organization, 175 million more people were exposed to heat waves compared to average years, although no direct linkages have been drawn in Ghana between deaths and exposures to health, indirect links have been drawn, especially with the death of persons whose occupations see them exposed for a long time to extremely hot temperatures such as farmers and open market traders. “[Hot weather can] result in excess mortality, and cascading socioeconomic impacts e.g. lost work capacity and labor productivity,” the WHO notes. With majority of Ghana's population being socio-economically disadvantaged and many physiologically vulnerable, the country is at a greater risk of losing its human resources to the extreme temperatures. The quest for staying cool amidst the uncomfortable situation is taking a financial toll on many individuals and organizations. 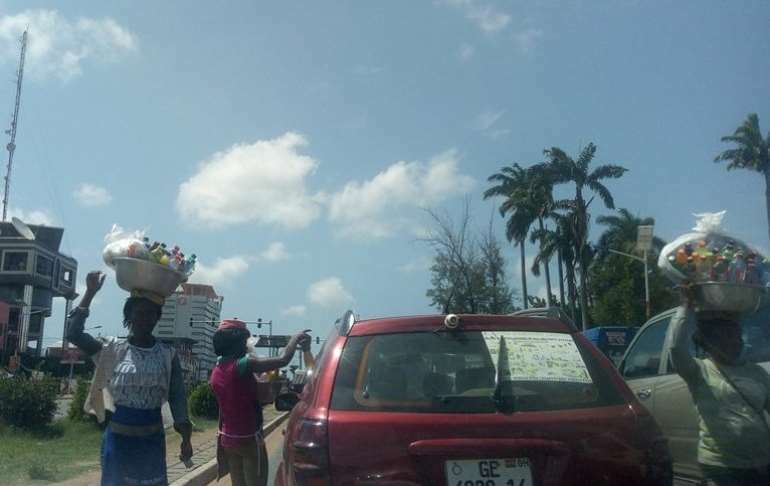 Simon Appiah, an Uber driver in Accra couldn't hide is frustration as he now spends more on fuel due to the high demand for air-conditioning from passengers and himself throughout the day. “Each day I make about 20 trips and for almost everyone I pick, they want air-condition but it is costing me money. I have to buy more fuel because of that but the truth is that, even for me myself, because of the hot weather nowadays, when I'm not taking a break somewhere after driving for a while, I turn it on because the heat can be unbearable,” he said. Many organizations are also investing in air-conditioning units and other electricity-powered technology to keep offices cool and this does not come cheap at all. Interestingly, the growing use of these units also has a negative impact on climate. Researchers at Lawrence Berkeley National Laboratory, the International Energy Agency (IEA), and Rocky Mountain Institute (RMI) have concluded that room air conditioners alone – the typical window and split units used in most homes – are set to account for over 130 gigatons (GT) of CO2 emissions between now and 2050. That would account for 20-40% of the world's remaining “carbon budget,” yet fewer organizations and households in Ghana are taking to green solutions to adapt to hot weather. Ghana, although one of the few in Sub Saharan Africa with a National Climate Change Policy document and an implementation plan for its Nationally Determined Contributions, still has a long way to go in meeting its obligation as a signatory to the 2015 Paris agreement that seeks to keep global warming to less than 2˚C above pre-industrial levels. There is yet to be a major policy or plan towards achieving the target even within the transport sector which is estimated to be largest source of carbon emissions. Public education on climate change and government-driven push for eco-friendly alternatives remain extremely low although the president, Nana Akufo-Addo has been heard on local and international platforms state the importance of national action for adaptation of climate change effects. The lack of enforcement of forestry laws, inadequate financial investments for afforestation and the lack of deliberate state-led campaign for tree planting has resulted in the fast decline of the country's forest cover. Until such measures are taken, the lives of millions of the majority economically and socially vulnerable Ghanaians, stand at risk to the threats of the impacts of climate change. But individuals, as much as possible, owe it a responsibility to their personal health and sanity to take precautionary measures such as hydration, and putting on lighter clothes and sunglasses to withstand the situation.